This is another one of those things that absolutely mystifies new parents and non-parents -- infants and toddlers are constantly choking on things. They can choke on almost any piece of food. If you drop a coin on the floor accidentally, they will pop it in their mouths and then choke on it. They will choke on the small parts of toys that your older kids play with. Choking is a constant hazard. Choking is one of the reasons why you cannot ever let an infant or toddler out of your sight. Especially if your child is eating solid food, you must watch constantly, because choking is something that only takes a minute to cause serious damage. 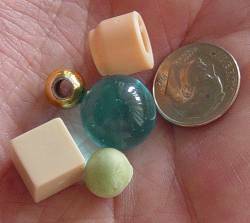 Keep all small objects -- coins, marbles, pebbles, etc. -- cleaned up and out of reach of small children. Learn how to dislodge a small object if your child is choking. There is a Heimlich Maneuver for infants, and you should learn it. But in most cases you can simply place your hand on the child's chest and hold the child slightly inverted to solve the problem. If you are a non-parent or a new parent, hang around a parent with a crawling infant or a toddler at mealtime. Every 10 minutes or so the child will choke on something, and you can see how the parent solves the problem.